One of the highest treasured food of the world, chocolate dates to 2000 BC. Maya from Central America first connoisseurs of chocolate had it as bitter fermented food drink with wine and spices! Chocolates made from beans of Cocoa plants by fermenting, drying and roasting of the beans. The fat that sits around the nibs is extracted as cocoa butter which has other health benefits. Nibs are used for chocolate liquor. Cocoa bean ground into cocoa powder used in baking and beverages. Our favorite healthy snack dark chocolate contains nearly 90% of cocoa solids, cocoa butter and sugar unlike milk chocolates which has about 10 to 50% of cocoa solids. Lower quality dark chocolate will have traces of milk, vegetable oil and butter fat and does not taste the way it should be. White chocolates make of cocoa butter, sugar and milk without cocoa solids. Polyphenols, flavanols, catechins are other compounds present in dark chocolate. Presence of flavanol – rich cocoa solids in dark chocolates (2-3 times more than milk chocolate) helps production of nitric oxide in endolethium inner lining of blood vessels and relaxes blood vessels. Relaxed blood vessels mean improved blood flow and lowers blood pressure. In Kuna Indians, an isolated tribe in Caribbean coast hypertension was extremely low. Kuna Indians traditional intake of cocoa was high almost five cups a day, leading to high flavanols in their body. Flavanols helps to increase insulin sensitivity, good for heart and could reduce risk of diabetes. Dark chocolate improves HDL cholesterol and insulin sensitivity. Anti-oxidants are highly protective against the oxidation of LDL. All antioxidants and mineral substances help supporting healthy skin! Flavanols improves blood flow to skin and keeps it hydrated too! Did you know? Studies show dark chocolate may improve brain function. Eating high flavanol cocoa improves blood flow to brain and keeps it alert and active. 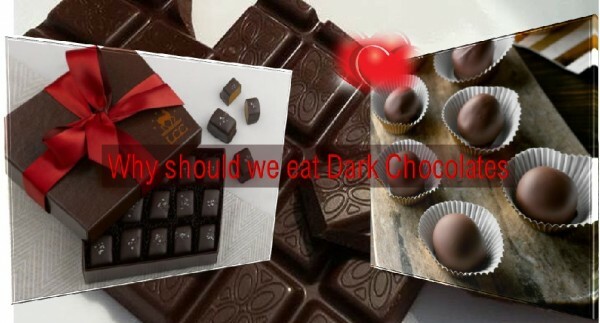 When you purchase dark chocolates for your loved ones on this valentine’s day choose 70% dark chocolate or higher to obtains the most flavanols as it contains more cocoa solids and bit more bitter for all good reasons. Store dark chocolates in dry, dark place and it will last up to two years. Do not refrigerate as the moisture make sugar to bloom on the surface and look will not be appealing. However, you can melt bloomed chocolates and use it as chocolate syrup!